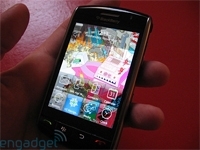 BlackBerry OS 4.7.0.113 coming to Verizon's Storm | BlackBerry Blast! The next official OS version of Verizon's BlackBerry Storm will be 4.7.0.113. According to engadget, Verizon will make OS version 4.7.0.113 the official version for its BlackBerry Storm. The last official update for Verizon's Storm was four months ago, meanwhile we've seen a flurry of leaked OS builds since then. If you can't wait for Verizon, you can download an unofficial copy of 4.7.0.113 at the link below.